Komfortable und gut eingerichtetes Cottage auf den Klippen. Wir fanden das Cottage ohne Umwege. Der Zugang zum Haus war einfach und wie durch die Vermieter beschrieben. Das Haus liegt auf den Klippen mit einem grossen Park vor dem Gebäude. Den Zugang zum Strand bzw. zum Wasser direkt ab dem Grundstück haben wir nicht gefunden. Das dürfte aus der steilen Felsenklippe heraus auch schwierig sein. Das Cottage ist komfortabel und gut eingerichtet. Alles funktionierte zu unserer Zufriedenheit. Die Vermieter reagierten sofort und professionell auf unsere Kontaktanfragen hin. Wir danken den Gastgebern für ihre Gastfreundschaft. Wir erlebten einige gute Tage in Torquay. Absolutely loved cottage and situation. Great to be able to bring dogs. Jenny spoke at length to this person and offered our gorgeous £2,000,000 home, Waterside house or Westwing cottage. This guests choice was the cottage. No downstairs toilet but 2 super en suite bathrooms upstairs. Custom made winding Oak staircase clearly visible on the website. 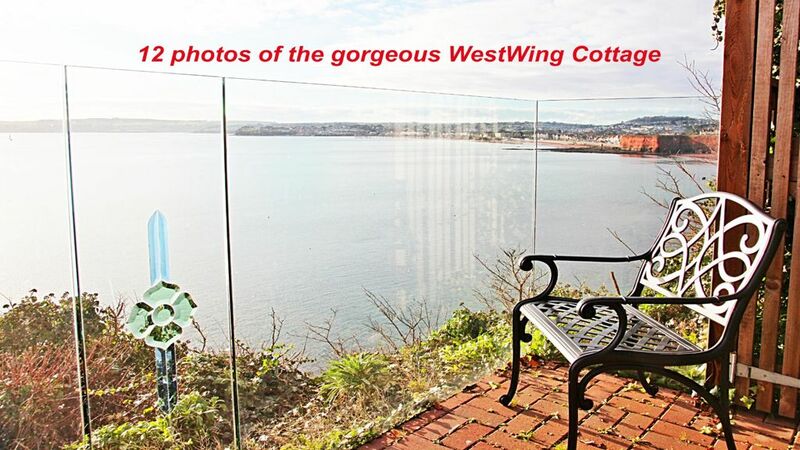 These guests chose the lovely Westwing cottage with spectacular edge of the water views. With reference to the sofa these are hand made 8 way hand tied at a cost of £3,000, so yes they are soft, comfortable and luxurious to sit in. The mind boggles at what people complain about. We were initially cynical about the impressive reviews - there was no need. This house has to be the best we have stayed in. Lovely furnishings, very clean (housekeeper is a credit to the owners), beautiful and very comfortable beds (both rooms with TVs - not clear in description). We had a thoroughly wonderful time and would recommend this property wholeheartedly. We will definitely book it again. Thanks for the superb review - I have forwarded a copy on to our Housekeeping service as it is great for them to hear that all their hard work is appreciated. We hope to welcome you back again in the future. Amazing property , great location , fantastic holiday . Fantastic holiday , great property with amazing views . We appreciate you taking the time to write such a great review and invite you to book again in the future. the west wing rockside torquay. what a view over looking Torbay. We had a lovely relaxing week. visiting Paignton & Torquay. And taking the ferry to Brixham (£3 return yes £3) rockside is well situated for a base for exploring Torbay and the south west. Rockside was just a lovely place to enjoy it for itself.